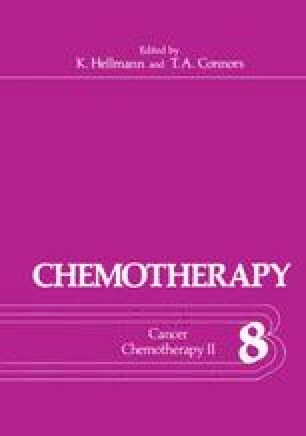 Two Hundred Nineteen (219) patients with various malignant diseases have been treated with cis-platinum diamminodichloride (PDD) during the last 4 years at the Wadley Research Institute. Early animal trials were done by Rosenberg (1)(5) et al. and Speer and Ridgway (11). Clinical usefulness of PDD has been shown by Hill (10) et al.,Talley (6),Welsch (7),(9) and Higby (13). Commonly employed dosage of PDD was 1/2 mg. to 2.5 mg/kg. Schedules have varied from 1/2 mg/kg. b.i.d. to the maximum single dose of 2.5 mg/kg. Total course doses varied ordinarily from 2 to 4 mg/kg. with an interval between courses of at least one month. Treatment was pursued until limiting toxicity or complete remission was observed. The toxic reaction causing the most concern is dose related renal tubular damage. BUN, creatinine, uric acid and creatinine clearance were closely followed. Urine creatinine clearance less than 50 cc/min.disqualified the patient from PDD treatment. Side effects related to hypersensitivity were only seen in one case recently reported by Dr.Khan (15) et al. PDD was used alone and in combination with other drugs such as amethopterin (AME) cyclophosphamide, thioguanine (Protocol designated as PACT) or followed by 5 FU, cyclophosphamide, vincristine, AME, given over 5 days or bleomycin, vincristine or vinblastine.